When we see EDC multi-tools, they are more often than not a bit novel. While they do have real world purposes, there’s not many instances where we would actually use them. Some are more precautionary measures as you don’t know when you’re going to have the bad day that will make you question your sanity. However, some of these full-sized multi-faceted tools will not only be useful regularly, but will also help you find several tools at once. 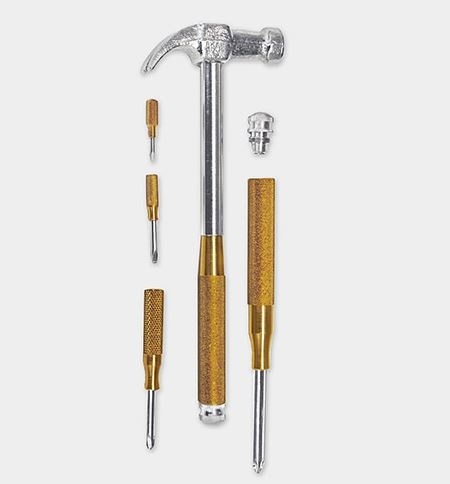 This 6-in-1 Tool is made of brass, steel, and aluminum, and gives you a fair amount of staple items from any handyman’s toolbox. When completely put together, it looks like nothing more than a claw hammer. Of course, the other four tools hiding inside of it are what makes this interesting (the hammer and nail pry count as two tools). There are four screwdrivers housed inside of this hammer, two of which are Philips, while the others are straight heads. This is only going to cost you $20, and while the idea is wonderful, the materials it is made of might give it a bit shorter lifespan than most tools of the trade in regards to regular, heavy-duty use. However, this could be very helpful for spur of the moment uses when you’re on the road. This way you won’t have to worry about a tool escaping your designated place for them and rolling away under a car seat. Of course, if you lose one tool, you’ll have to deal with losing them all.